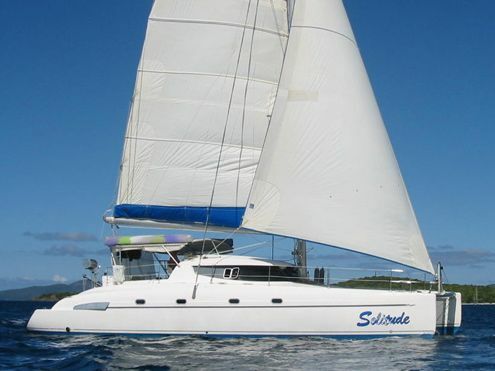 The charter yacht Solitude, a 46-foot Fontaine Pajot catamaran, has a special offer for charters taking place between now and December 15, 2010. OCEANS SEVEN SQUARED or OCEANS 72, ex-KALIKOBASS II, has received an updated interior and other upgrades. 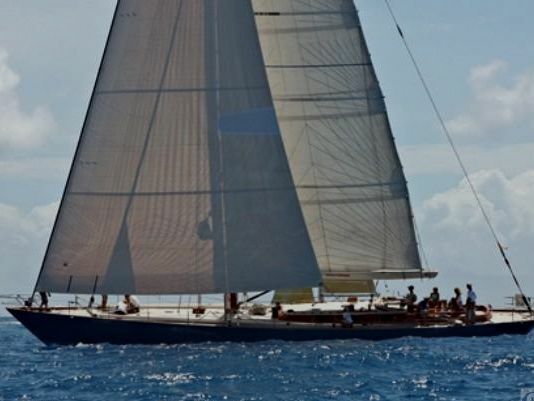 She will depart this week from Gibraltar and will arrive in the Caribbean in December. Captain Matthew “Kippa” Satchwell and Chef Katie French are looking forward to being back in the Caribbean and their first charter over New Years. OCEANS SEVEN SQUARED has four spacious double staterooms each with King bed which can convert to twin singles. 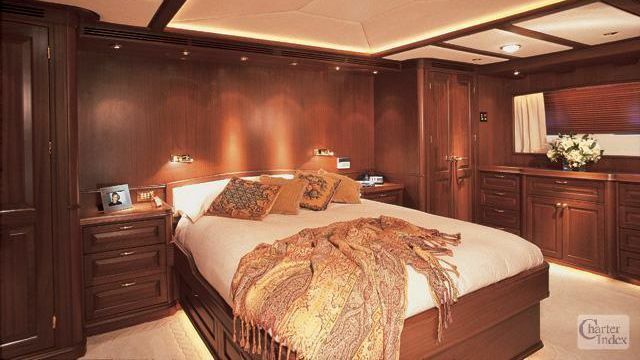 The two forward guest staterooms have a partition that can be removed to make a large master cabin with centerline King bed. (In this configuration OCEAN 7 Squared is suitable if there are 6 guests or fewer in the charter party.) All staterooms have ensuite bath with stall shower & seat for added comfort with closing glass door. Guest staterooms are complete with entertainment center including television, DVD, sound system, beverage refrigerator, safe and air conditioning unit with controls. Crew quarters, galley & crew mess are located aft. Are you looking for a large, luxurious sailing yacht to charter for the holidays? 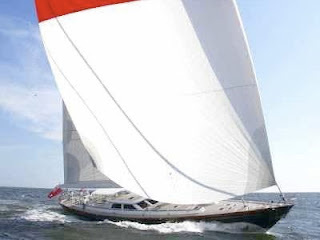 Consider Volterra, Clevelander, and Whisper... 7-night holiday charters OK! Holiday rate: $25,000/week plus expenses. Happy Holidays from all of us at Paradise Connections! 2011 BVI Wreck Week - Promenade cabin week special event! 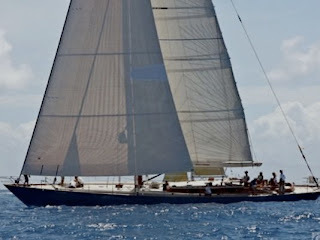 The charter yacht Promenade, a spacious 65-foot trimaran that accommodates up to 10 guests, announced that they will be participating in BVI Wreck Week which is taking place May 28 - June 4, 2011. This week is open to cabin bookings. This is the third year that the dive operators and the BVI Tourist Board have teamed together to put on fun diving and activities, both on the water and on shore. 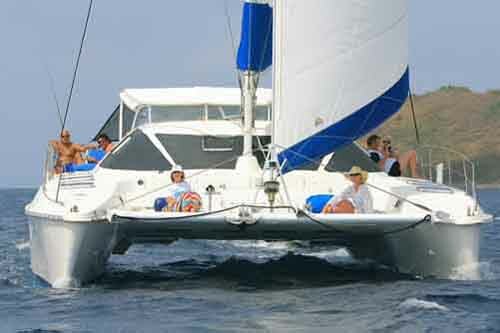 Your BVI Wreck Week charter will include 7 nights aboard Promenade, a fully air conditioned, 65-foot trimaran with a beam of 35 feet... a very stable platform. The charter fee includes all on-board buffet meals, cocktails and hors d'oeuvres, wine with dinner, all diving, and other water sports including fishing, waterskiing, kayaking. 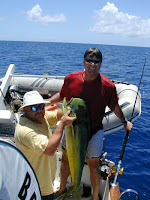 $1700 per person, based on 2 guests per cabin ($3400/cabin, double occupancy). Day One: Board Promenade anytime after 4 pm at Village Cay Marina in Roadtown. The first night will be spent on dock, allowing you to participate in any kick-off parties, and you can choose to have dinner and breakfast at any of our local restaurants. (This is a "sleep aboard" night so tonight's dinner and tomorrow's breakfast services are NOT included in the package price). Day Two: Promenade will serve a light lunch while sailing over to the wreck of the FEARLESS outside Great Harbor on Peter Island to do our first wreck dive. We will anchor for the evening at Little Harbor on Peter Island. Day Three: After breakfast, we will dive Carrot Rock on the outside of Peter Island, one of our favorite dive sites, with pinnacles reaching from 70 feet up to the surface. Lunch will be at White Bay at Peter Island with time for a beach excursion or snorkeling trip before we dive “Brown Pants” on the outside of Norman Island, or Santa Monica Rock (so named for the Santa Monica that hit the pinnacles here on April 29, 1783 and subsequently sank at Water Creek on St John). We will anchor for the night at Privateer Bay on Norman Island. This anchorage is also known as the Caves at Treasure Point and the setting of Robert Louis Stevenson’s Treasure Island. Day Four: After a snorkel before breakfast with all the Glassy Eyed Sweepers in the caves, we will take a short hop over to the Indians (so named as they look like an Indian's feathered headdress from a distance), where we will do a dive before sailing up to Salt Island for lunch. After hearing the history of the wreck of the Rhone, we will dive the Rhone in the afternoon. We'll have an after-dinner SCUBA to watch the turtles sleeping underneath the wreck, and see lobsters and crabs wandering around. This, bar none, is not only the best wreck dive in the Caribbean, but also in the Top 5 Dives of the World. We will anchor overnight on Salt Island. Day Five: Up and in the water for an early pre-breakfast dive before anyone else has a chance to disturb the wreck. This will cap off our SCUBA diving on the RMS Rhone. Additional wrecks planned for our diving agenda today: the Beatta, the Inganess, the Marie L, and the Pat. Day Six: Weather permitting, we sail out to the wreck of the CHIKUZEN, our second most famous wreck. We will dive the Chikuzen before lunch and again after lunch before taking a leisurely sunset sail into Muskmelon Bay on Guana Island, one of our favorite deserted anchorages. Or, perhaps we will head out to the Rocus and the Parametta? It all depends on the weather! A night dive is planned for those interested. Day Seven: After a breakfast spent watching the pelicans circling over this bay filled with a gazillion bait fish, we will go around to the outside to dive Grand Central Station. Grand Central Station is so named for the many fish that converge around here, and it is capped up by a spectacular large cave that goes through the island at about 60 feet. Perhaps this afternoon will be a good time to visit the Baths? Day Eight: Sadly, it is time to sail back to the marina, disembark and leave paradise, albeit with great memories. We will be back in the marina by mid-morning so, for those divers with flights that leave later on in the day, your luggage can be stored while you shop and explore Roadtown. 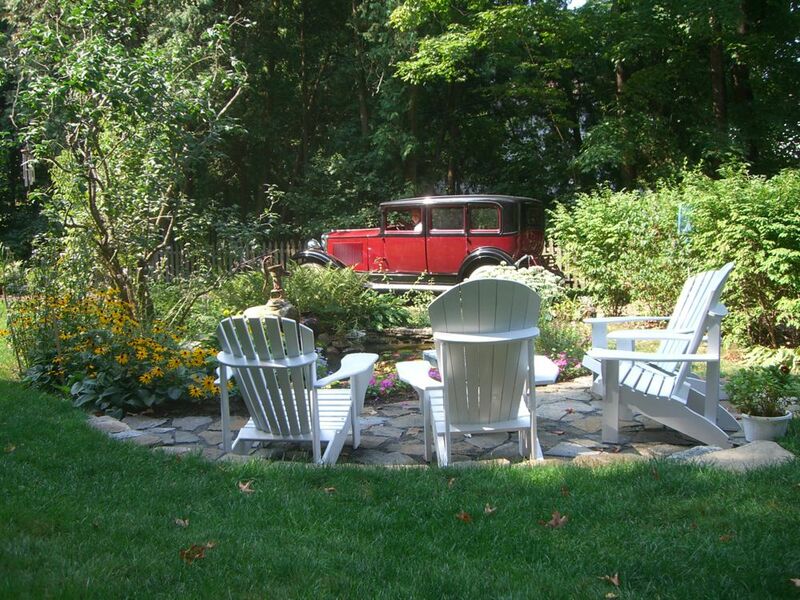 There are TWO cabins available beginning February 13, 2011. Book for 6 or 10 nights... Click HERE for details. This morning we received a newsletter from Tim & Julie, owner-operators of the Motoryacht McGregor. 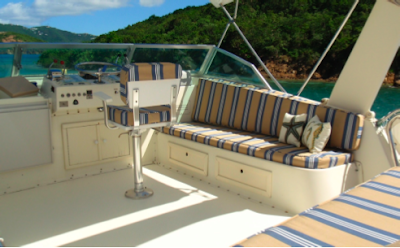 We replaced all of the flybridge cushions this summer and went with a new colorful stripe. Julie’s throw pillows finished the project off with an aquatic flair. Adding a new pair of Klipsch outdoor speakers will keep the music rocking!!! We also replaced all of the cushions on the foredeck with new foam and pin-tucked vinyl. The sunbathers are really happy with the new ultra soft bunny pad cushions!! All of the decks on McGregor have been coated with sparkling Awl Grip paint. 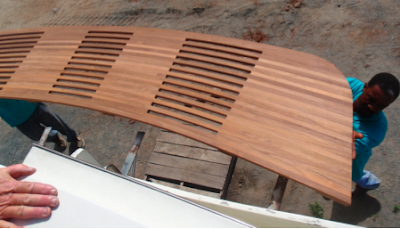 Our friends in Virgin Gorda fabricated a new hand crafted teak platform, one strip at a time!!!! New fixtures and Corian back-splashes finished off our three bathrooms. We rebuilt a storage locker in the cockpit with a new Afromosia teak board. All the varnish is in tip top shape with numerous coats added in the last month! 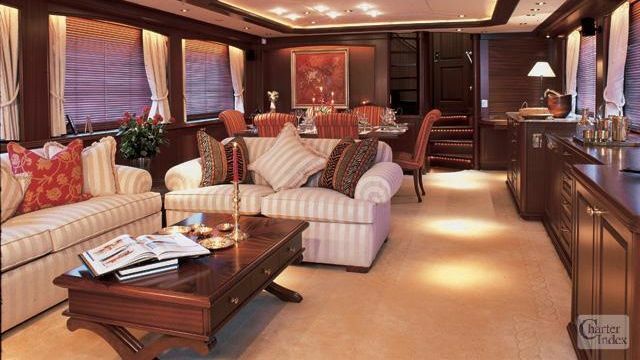 McGregor is a 58-foot Hatteras motor yacht with a crew of two. McGregor is fully air conditioned and has a large cabin aft with queen-sized berth, another guest cabin can be set up as a Queen berth or as two single berths, and a forward cabin with an upper/lower v-berth, all cabins have ensuite heads/showers. McGregor has a 15-foot dinghy with 60HP motor, kids & adult waterskis, kneeboard, wakebaord, snorkel gear, fishing gear, kayaks, tube, squirt guy arsenal, aquanaut, etc... Lots of toys... A fun boat. Three color TVs and three DVD players. Tim is a diving instructor and 8 dives/week for certified divers are included in his rates, plus FREE resort/discover scuba courses are included for non-certified divers who want to try out scuba. McGregor is a non-smoking yacht. Standard rates: the 15% holiday premium has been waived! Can't make it for the holidays? Check with us and see if YOUR dates are available. 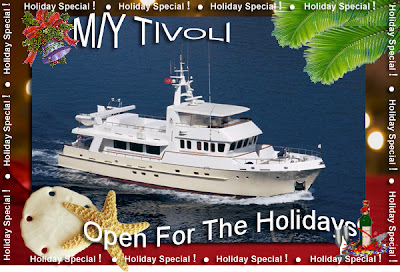 The charter yacht TIVOLI, a 90-foot motor yacht, has lowered their rates for the 2010-11 winter season... including the holidays! Based in Antigua but available anywhere in the Caribbean (with delivery) TIVOLI can accommodate 6 guests in three staterooms that radiate from a central foyer. The master stateroom has a centerline queen bed and separate 'his & hers baths' -- one with spacious marble shower and one with steam shower & whirlpool tub. Two guest staterooms have twin lower singles with enclosed marble showers in the ensuite baths. TIVOLI is elegantly decorated and fully air conditioned through out. 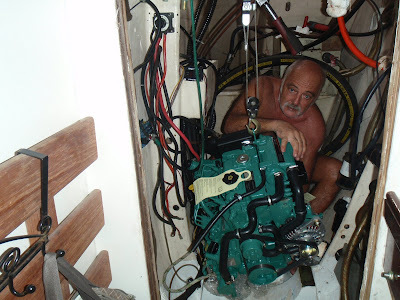 Crew has a separate companionway, heads and shower. Chris & Kelly, owner-operators of the charter yacht VERNA BREEZE, dropped us a line this morning to tell us about their honeymoon special. Verna Breeze has completed a successful first year of chartering and are back again for "Round 2". 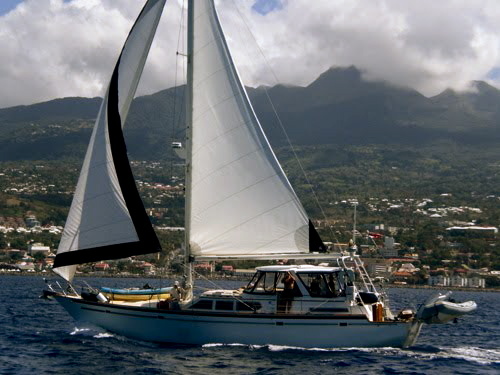 Although this is the beginning of their second charter season, Chris & Kelly have been cruising for several years and are definitely not newbies to sailing. 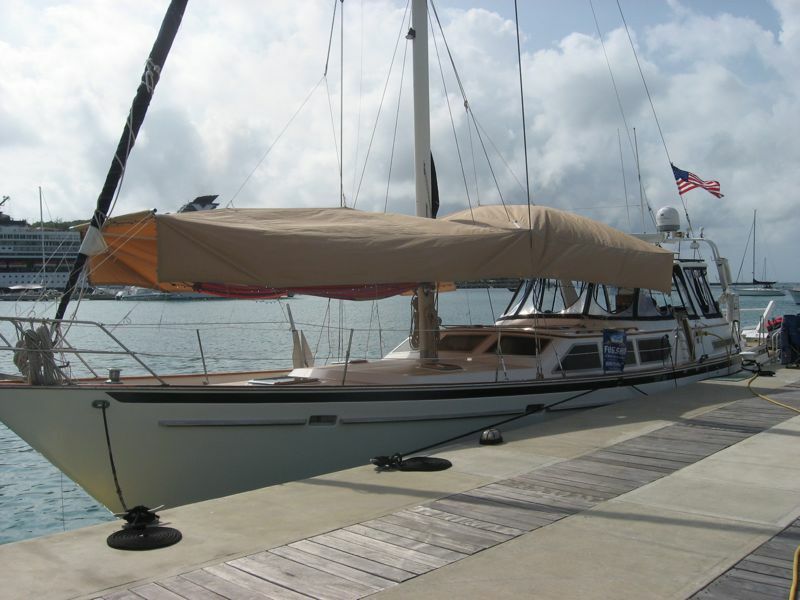 Verna Breeze is typically a 2-guest boat, but they do have an additional guest cabin with two single bunk beds. They love family charters... KIDS ARE WELCOME. 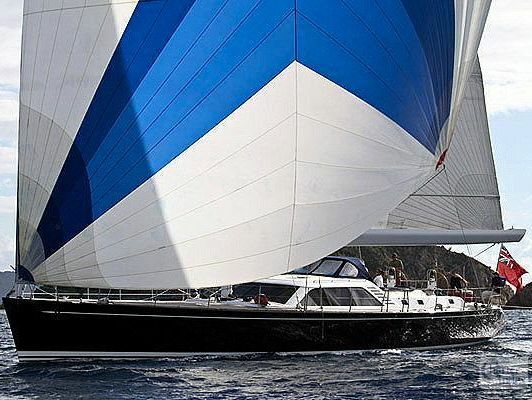 The motoryacht FLAME is one of our favorite charter yachts in the Virgin Islands. Wayne & Barbara, owner-operators of Flame, have been chartering for 20-plus years and they still enjoy sharing their boat and the islands with their guests. 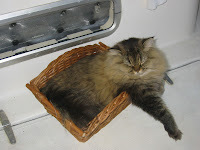 Jacob, the ship's cat has been aboard for about 5 years now, and is much loved by all. Way back when they discovered Flame, she was in quite a state of disrepair (fire damaged as I recall, hence the name "Flame") but it was love at first sight. Flame's restoration and reconfiguration took a full three years and they did all the work themselves. Their love for their home truly shows with the meticulous upkeep and maintenance they bestow upon her. A very fine vessel, indeed. Flame is a fully air conditioned, 65-foot Feadship motoryacht that accommodates up to 6 guests in 3 equivalent cabins, each with private ensuite head/shower. 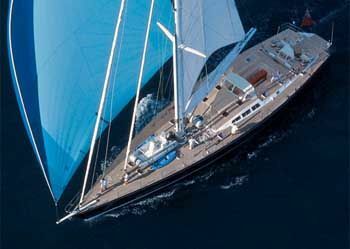 Originally built in 1956, she has a classic style that is very appealing. 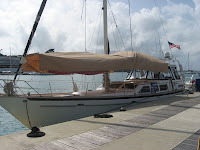 Flame has a large, covered aft deck which is great for dining and just relaxing out of the direct sun, yet still enjoying the cooling tradewinds. They have a 15-foot dinghy with a 85HP motor, waterskis, tube, snorkel equipment, 2-person kayak, two TV/VCR/DVD, iPod with 6000 songs that can be broadcast in any cabin, bocci and lots of other beach games, too! FLAME is currently available for a CHRISTMAS charter through December 26th. Open for Easter! Check with us and see if YOUR dates are available. Christmas is coming and Paradise Connections would like to send you a gift! HAVE YOU BEEN NAUGHTY OR NICE ??? 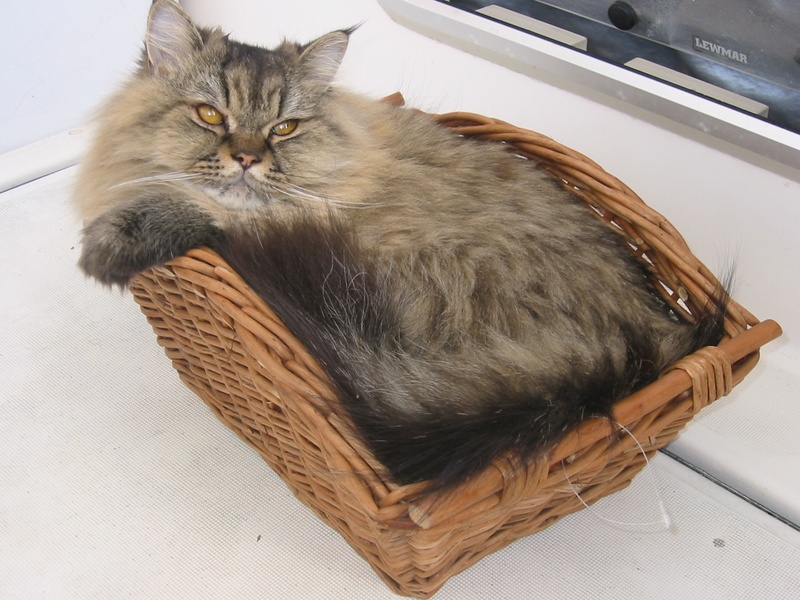 Don't let its tiny size fool you. 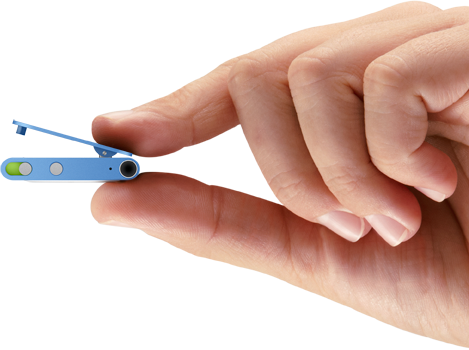 With this 2GB player, you can pack up to 500 songs... That should do you for a week! Load it up with your favorite tunes, audiobooks, podcasts you've been meaning to get to, or maybe study a foreign language. It's your vacation and it's your iPod so ENJOY! Pop off an email to us and let's get started on planning your next sailing vacation so we can send your Christmas gift. This was meant to be a fruit basket, but Sasha claimed it for himself. Gus & Marcella celebrated their 47th wedding anniversary on 10/10/10. CONGRATULATIONS!